Made for professional Supermotard & Motocross Racer. The lightweight high performance racing chain is the result innovative metal alloys and the latest manufacturing technology. 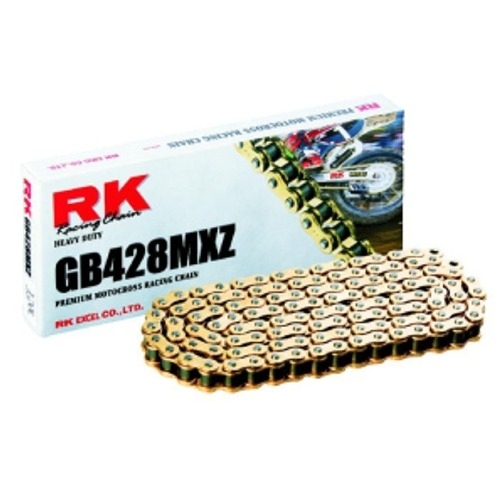 MXZ chains - chromium-alloyed steel construction with seamless rollers and bushings, and oversized specially hardened bolts for additional stability. All versions are heat-treated by the RK exclusive HIT procedure (Heat Induction Transfer). 428 MXZ high performance racing chains are among the strongest in its class and have an excellent price-performance ratio based on all MX Racing Chain in the world! We deliver an open 428 chain with clip-chain connection.